Now Marvo specifically asked for wonder bread, kit kat, and redi-whip, but I have Matthew's all natural white bread, kit-kats, and Garelick Farms whipped dairy topping. Close enough I say! [note, they use a special kit kat in Japan as well as a sweeter looking bread]. How was it? Well, I've had a lot worse. I do love Kit Kats ofcourse, and the overall combo isn't bad, but I don't think it's as good as the fast food version. If the whip cream was denser and the bread was sweeter, we might be on to something, but as is, it's just kind of a fun, one off project. Alright, enjoy the show, and have a good week! A Kit Kat sandwich would be killer between two slices of pound cake. oooo, nice, good call. denser, sweeter bread(like substance) would have worked better. 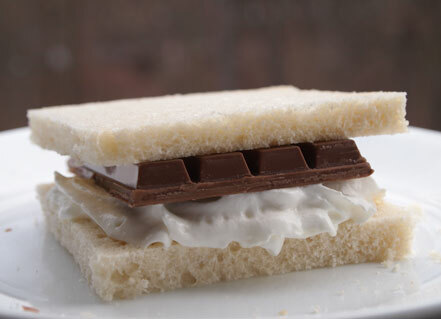 @Dubba I watched the YouTube video on the KitKit sandwich and agree that a melted candy bar would enhance the taste. Also, King's Hawaiian might make it taste better. As a variation, softened Philly Cheesecake flavored Cream cheese in place of the whipped would really make this work.